TOKYO, 2 October 2018 -- (ACN Newswire) -- JCB, the only international payment brand based in Japan, and Nowcast, a Japanese financial research and technology startup, are pleased to announce the release of the updated and expanded consumption index service JCB Consumption NOW on 5 November. JCB Consumption NOW was launched in May 2017 to enable users to track Japan retail consumption trends on a real-time basis. A wide range of national and local government agencies, institutional investors, financial institutions as well as consumer-goods companies have been taking advantage of the consumption indexes based on JCB group cardmember spending data. The updated JCB Consumption NOW will provide a breakdown by age, gender, and residence area of statistics for consumer spending - goods, consumer spending - services, and five industries including ecommerce. In addition, statistics will be released sooner than before for even timelier information. Click here for more information about JCB Consumption NOW. Based on actual consumption data so you can follow consumption trends by industry and channel of sales, analysis that is unavailable with other indexes. Now JCB Consumption NOW will provide even finer-grained analysis by age, gender, and residence area. 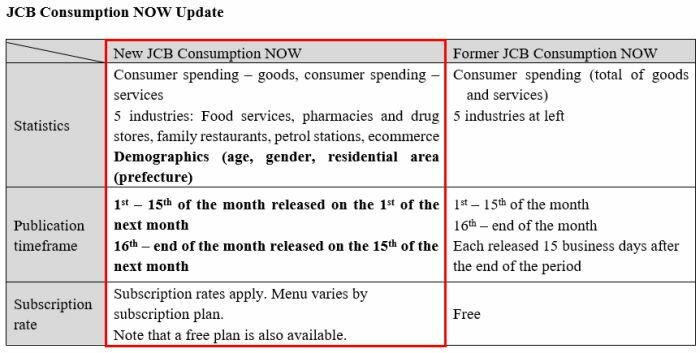 Consumption indexes for actual spending from the 1st to the 15th of the month is available on the 1st of the next month, and for spending from the 16th to the end of the month on the 15th of the next month - faster than other consumption index services. The index uses a data sample from JCB group cardmember payment information, providing statistics that are close to the population of Japan as a whole with a high degree of accuracy. Customer payment and demographic information is anonymized as required by Japan's Act on the Protection of Personal Information to protect the privacy and personal information of JCB cardmembers. The updated JCB Consumption NOW uses anonymized JCB cardmember payment information to calculate consumption statistics. Anonymized information is processed as required by Japan's Act on the Protection of Personal Information so that individuals cannot be identified from the information and the information cannot be restored to an unanonymized state. JCB encrypts the anonymized information and transmits it to Nowcast via secure channels. Note that individual JCB cardmembers cannot be identified with the information provided by JCB Consumption NOW.